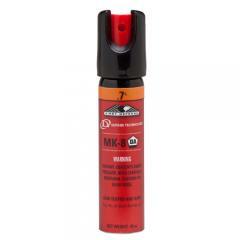 The 56784 First Defense MK-8 from Def-Tec is a pocket-sized, ultra-portable personal defense spray. Despite its small size, it is still powerful enough to subdue a suspect with ease thanks to its 0.7 percent major capsaicinoid aerosol formula. It fires in a cone pattern, reducing the need for pinpoint accuracy and allowing it to hit the entire face, making it especially useful at close range. Each one contains 0.42 ounces of formula, enough for five to seven short bursts at an effective range of up to 12 feet. Its non-flammable formula is also safe to use alongside electric discharge weapons, so it can be used alongside other less-lethal solutions.